Victor Stiebel trained with court dressmaker Terry Reville before establishing his own fashion house on Bruton Street in the 1930s. 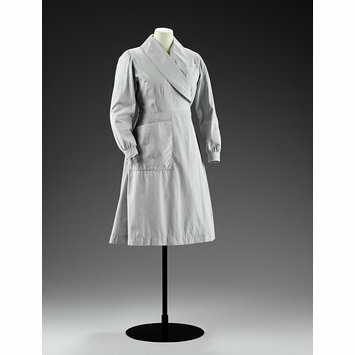 In 1942 he joined the Incorporated Society of London Fashion Designers and, along with other society members, produced Utility Clothing designs for the Board of Trade. After the war he designed for London-based textile manufacturers Jacqmar, and became Chairman of the Incorporated Society. He reopened his own house in 1958 but was forced to close in 1963 on health grounds. 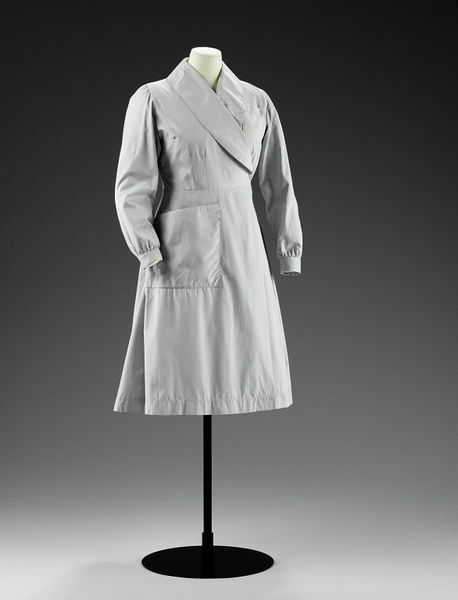 Notable commissions included uniforms for the Women’s Royal Naval Service (1951) and the Women’s Royal Air Force (1954) and the going-away outfit for Princess Margaret on her marriage to Lord Snowdon in 1960. He was best known for his striking, sculptural, one-off evening dresses. The overalls, designed by Stiebel and made by Hebert Liveries Ltd, are of pale blue, thick cotton and are practical in design with long sleeves and a single deep pocket at the front. The overalls cross over at the front and fasten with long ties around the back. The oversize lapels, nipped-in cuffs, fitted waist and wide ties provide stylish, feminine accents to a practical garment. The overalls were bequeathed to the museum by Audrey Faith Baker who wore them when she worked as a florist at Constance Fry Ltd in the 1960s. Faith Baker recalled that Stiebel's brief was to produce a working overall that would flatter any female figure, be in sympathy with the florists' image (particularly in the environs of Chelsea), yet remain eminently practical and hard-wearing. Each member of staff at Constance Spry, 88 Pimlico Road, London was sent for a personal fitting and received two overalls for which they were entirely responsible. The overalls are made of pale blue, thick cotton and are practical in design with long sleeves and a single deep pocket at the front. The overalls cross over at the front and fasten with long ties around the back. The oversize lapels, nipped-in cuffs, fitted waist and wide ties provide stylish, feminine accents to a practical garment.